Recent scenes at the Damascus Gate. In my last post I introduced Jerusalem via the Damascus Gate of the Old City—the neighbourhood of my church. That week there had been two incidents at the Gate—a 16 year-old boy attacked police with a knife, and three West Bank men were shot dead when found with guns and bombs. The Damascus Gate continues to weigh heavily on my mind, as it has remained regularly in the news. In the past week there have been four more incidents. In two cases the attackers were shot dead; in the others a young woman and a young man were arrested. The ministry of foreign affairs describes all of these as terrorist attacks, incited by radical Islamist groups. The army Chief of Staff, on the other hand, commented on the fact that half of what is now nearly 200 such attacks in the past five months have been by young people under the age of twenty. Teenagers. Security forces have had no advance intelligence about any of the attacks, few of them had links to terrorist groups or strong ideological motives. Since September Palestinians have killed 28 Israelis and 4 others. More than 160 Palestinians have been killed — 111 during attacks; 50 in clashes with Israeli forces (figures change daily). The Damascus Gate seems to have become a focal point for young Palestinians. What is the reason for this wave of hopeless attacks by youngsters? Where might we begin to try to answer? Do we start with the present as it is, or view it all in the context of its history? Recourse to history is fraught with difficulties. How far back do we go? The 1967 war in which Israel first occupied the West Bank of Jordan and Gaza? The creation of the state of Israel by UN vote in1947? The Arab conquest of Jerusalem in 637 CE? The Jewish Hasmonean Kingdom of 135 BCE? I have seen all of these appealed to as explanation or rationale for actions of the present. The past is a tangible component of the present in the Middle East. An inescapable aspect of the conflicts which rage across the region is the clash of competing narratives about the past—the competing maps. But, for today, it is not the history I wish to note, but the present reality coming out of that history. That reality has two sides of consequence: one, the existence of the state of Israel, and, two, the ambiguous status of Palestine after nearly 50 years of Israeli administration as an occupying power. The first is, and must be, unequivocal; the second is, and must be, resolved. 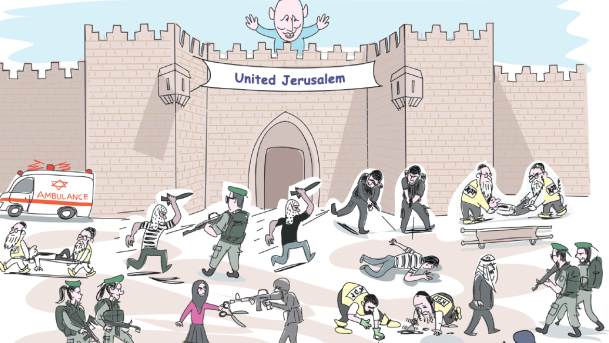 The Israelis live with the constant fear of terrorism; Hamas presents a realistic threat of violence at any moment, and the recent attackers from the West Bank have been able to enter Israel and settlements ‘below the radar’. The Palestinians, in turn, live under military occupation and governance, increasing building of permanent settlements in their territory, and regular destruction of their own houses with little warning (113 houses just last week). Hope of a solution is exasperated by a total lack of contact between the two communities, apart from the efforts of a few groups seeking reconciliation, and the absence of sufficient political will on either side. One thing that is inescapable to notice here is the security measures. There is the constant presence of police on the streets and street corners of the cities; outside of the cities there are army vehicles everywhere. There is the ‘security wall’, and control points; there is the continual military patrol of the borders, of the occupied territories, of the sea and the air; there is a huge network of prisons. The cost is enormous, and strains the national budget even with the vast subsidies from the US. It has to be clear, terror is not acceptable, nor in any way to be condoned. But if the only response to the security dangers is more security, tighter controls, screwing down the lid on Palestinian society, it can be no surprise if, as with any pressure cooker when the lid is kept on too long, there is an explosion. 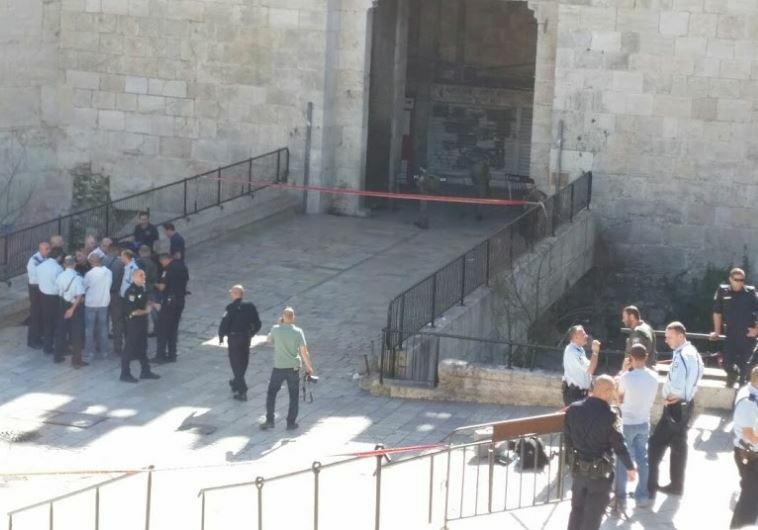 The question raised in my mind by the phenomenon of teenagers throwing themselves at police at the Damascus Gate is whether it can be labelled as terrorism in comparison to pipe bombs and missiles. These are children, no more than infants during the last Intifada. Fifty years of occupation has been corrosive to Israel’s democratic ideals, and has undermined all Palestinian institutions of society and development. Both communities suffer in a death grip with little hope of resolution. It would seem that desperation lies at the heart of the issue. I know that virtually everything I have written here will likely be contested by someone. But the reality that sparked this post is the particularity of six people lying dead at Damascus Gate in the past two weeks, in my neighbourhood. Six grieving families, Muslim and Jew. And local teenagers are in prison for assaults that will pursue them and their families for the rest of their lives. And no resolution is in sight. This is but a small example of the cycle of violence and response, violence and response, taking place in much more deadly fashion just across the border in Syria and across the Middle East. In each case we in the West are participants. Bombs and missiles rain from the skies from Western air forces to add to those on the ground. And while armed men vie for power, another generation of children is born into the normalcy of bloodshed.